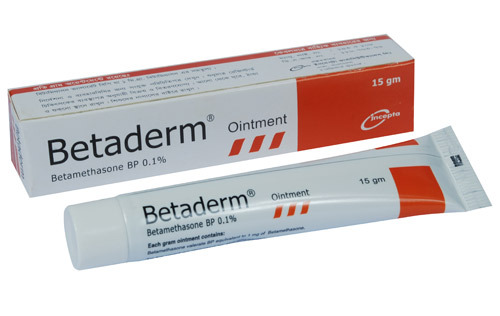 Each gram ointment contains Betamethasone Valerate BP equivalent to 1 mg of Betamethasone. Indicated in atopic, infantile & discoid eczema; prurigo nodularis; Psoriasis (excluding widespread plague psoriasis); lichen simplex or planus; contact sensitivity reactions; seborrhoeic dermatitis; discoid lupus erythematosus & adjunct to systemic steroid therapy in generalized erythroderma. Apply sparingly to the affected area 2 to 3 times daily until an improvement occurs. Burning, itching, irritation, dryness, folliculitis, hypertrychosis acneiform eruptions, perioral dermatitis, allergic contact dermatitis, maceration of the skin, secondary infection, skin atrophy, striae and miliariamay be reported. Avoid long-term therapy particularly in infant & children; the treated area should not be bandaged or otherwise covered or wrapped as to be occlusive unless directed by the physician. Avoid contact with eyes. There are no adequate and well controlled studies in pregnant women on teratogenic effects from topically applied corticosteroids and should not be used extensively for a prolonged period. Caution should be excercised when topical corticosteroids are administered in nursing women.